I'm an impulse shopper. It is a simple fact of my life that if something is really cool and I have money in my pocket, I will soon have a cool thing and no money. 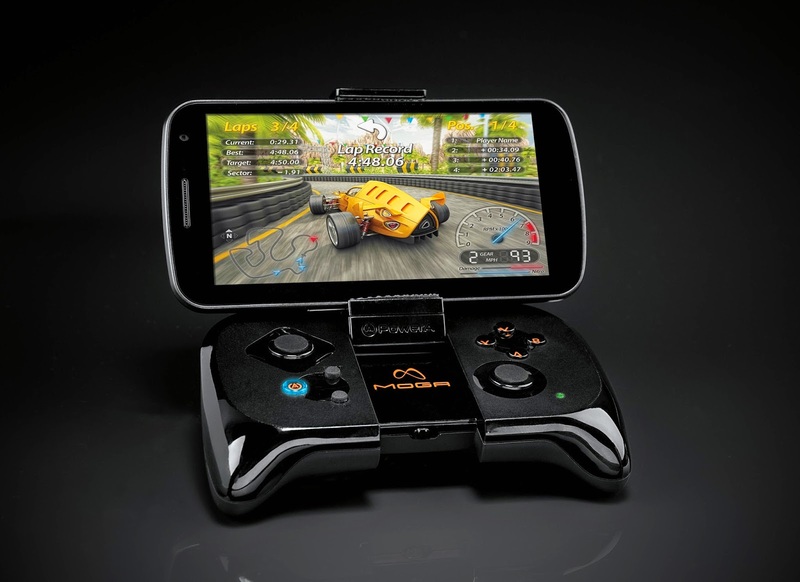 Such was the case earlier this week when I was at Gamestop and noticed a cool little device titled "Moga: Console Quality Gaming on Android Phone or Tablet". It did not hurt my inclination to be intrigued that there was a large sticker saying "free Sonic CD download with purchase" on the box. With a sticker price of only $17.99, the fact that I knew literally nothing about what the hell a Moga controller was even supposed to be didn't even make me think twice before slapping money on the counter and scurrying off to examine my new toy. I have to tell you, this thing is cool. It's a smallish and fairly thin gaming controller with the standard 4 button face, two shoulder button, start and select layout with a pair of thumbsticks for control. A small lip along the inner edge folds out into an adjustable cradle that will fit most any Android phone, which can then be connected via Bluetooth. The Moga app, available on Google Play, comes with a library of various Android games you can purchase which will all interface with the controller to give you that classic videogame feel on your phone, and checking out some of the more entertaining games like Usagi Yojimbo, the original Doom port, and a nifty little Castelvania meets steampunk gem called Dark Incursion managed to keep me fairly enthralled during my every free moment for the first few days. My fun really started a bit later when I started experimenting. Being the kind of person who secretly believes that video games will never get better than they were on the SNES, I have a fairly robust collection of ROMS to match my physical collection of SNES games. I was absolutely delighted to discover that the Moga controller automatically synced up with the Super GNES Emulator on my phone, allowing me to play all of my Super Nintendo games on the go. The fact that I occasionally get odd looks for swearing at Mega Man or Mario during the ferry ride to work serves as absolutely no detriment to the childish glee that I suspect this little device will continue to provide me for the foreseeable future. I recommend you pick one of these little beauties up and give it a whirl, and should you do so, I hope you get as much enjoyment out of it as I have so far.